Ingredients: DP Complete plant protein blend (organic sunflower protein, organic pea protein, organic sprouted pumpkin seeds), DP Digestive Fiber Blend (Organic Acacia Prebiotic fiver, organic sunflower sprout, probiotics, digestive enzymes (protease)), Organic Cocoa (Alkalized), Natural Chocolate Flavoring, DP Omega Green Blend (organic flax sprout, organic kale extract, organic spirulina extract), organic cane sugar, organic acerola, DP wellness support blend (organic amaranth sprout, organic quinoa sprout, organic millet sprout, organic buckwheat sprout, organic garbanzo bean sprout, organic lentil sprout, organic adzuki sprout, organic chia spout, organic sesame sprout, organic green tea), Monk Fruit, Citrus Fruit Extract. Mix 1 scoop with 8 oz. of cold water or unsweetened almond milk and shake well. Blend with Greek yogurt and fruits or veggies for a great-tasting smoothie. Ingredients: DP Complete plant protein blend (organic sunflower protein, organic pea protein, organic sprouted pumpkin seeds), DP Digestive Fiber Blend (Organic Acacia Prebiotic fiver, organic sunflower sprout, probiotics), digestive enzymes (protease), Organic Natural Vanilla Flavoring, DP Omega Green Blend (organic flax sprout, organic kale extract, organic spirulina extract), organic cane sugar, organic acerola, DP wellness support blend (organic amaranth sprout, organic quinoa sprout, organic millet sprout, organic buckwheat sprout, organic garbanzo bean sprout, organic lentil sprout, organic adzuki sprout, organic chia spout, organic sesame sprout, organic green tea), monk fruit, citrus fruit extract. 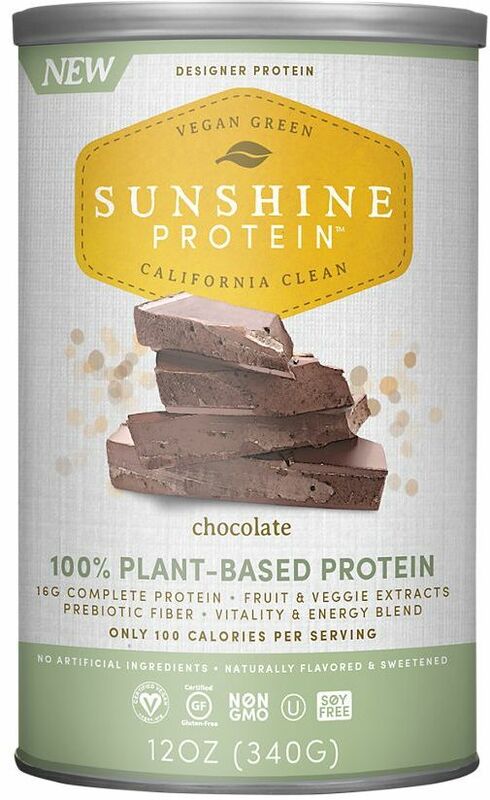 16g of non-GMO, vegan protein from powered by sunflower protein, plus pea protein and sprouted pumpkin seeds, all derived from organic plant whole foods. Sunflower seeds are naturally rich in glutamine, which is important for muscle maintenance, recovery from injury and stress, and immune health. Sunshine Organic Proteins (Organic Pea Protein, Organic Sunflower Protein, Organic Sprouted Pumpkin Seeds), Digestive Health Blend [Organic Acacia Prebiotic Fiber, Organic Sunflower Sprout, Probiotics (Lactobacillus Acidophilus, B. Longum, L. Plantarum), Digestive Enzymes (Protease)], Natural Vanilla Flavoring, Organic Vanilla Flavoring, Omega Green Blend (Organic Flax Sprout, Organic Kale Extract, Organic Spirulina Extract], Organic Cane Sugar, Organic Acerola, Wellness Support (Organic Amaranth Sprout, Organic Quinoa Sprout, Organic Millet Sprout, Organic Buckwheat Sprout, Organic Garbanzo Bean Sprout, Organic Lentil Sprout, Organic Adzuki Sprout, Organic Chia Sprout, Organic Sesame Sprout, Organic Green Tea), Monk Fruit, Citrus Fruit Extract. Mix one scoop with 8 oz cold water or milk (skim or your favorite non-dairy) & shake well. Blend with Greek yogurt & fruits or veggies for a great-tasting smoothie.